The Edo Usuba is reminiscent of a small cleaver and has a blunt tip that comes in handy for such things as cutting the eye out of a potato. The Usuba is hefty enough to chop through heavy root vegetables with a blade that can thinly slice delicate tomatoes. 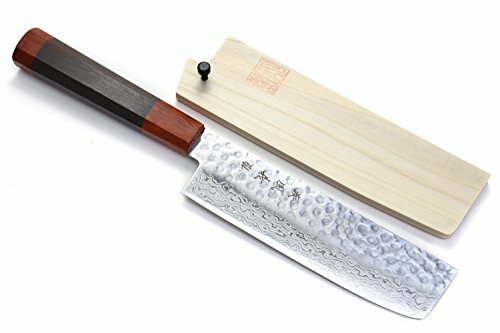 One of the most sought after of knives and fast becoming a new essential companion to the popular chef's knife is the traditional Japanese vegetable knife known as the Usuba. Reminiscent of a small cleaver, this knife is cherished for its ability to chop through root vegetables to thinly slicing delicate tomatoes. From prepping greens for a salad to chopping vegetables for a main dish, the simplest of tasks are elevated with a handcrafted knife that is as beautiful as it is functional. Our Nickel VG-10 Gold Hammered Damascus Usuba Knife is forged with a traditional straight blade that smoothly cuts paper thin slices and can quickly chop through hearty vegetables. Forged and hammered with 46 layers of steel in the Damascus tradition with a Nickel VG-10 Gold Core, this knife is complimented with a traditional Japanese style handcrafted natural Shitan handle affixed with a double redwood bolster. A protective wooden sheath called a "Saya" is included, which protects the knife and adds to its appearance when not in use. The hammered texture of the blade eliminates friction and keeps food from sticking to the blade. Every knife from Yoshihiro is handcrafted by master artisans creating a unique one of a kind work of art.